The Basement Tapes (1975), The Bootleg Series Vol. 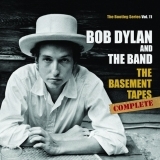 11: The Basement Tapes Complete (this album) (compilation) (2014). Sorry, no matches on eBay for "This Wheel's On Fire Bob Dylan & The Band".